Arrested for DUI in San Francisco? You may be uncertain what happens next, and where to turn for help. Defendants charged with drunk driving in the Bay Area face stiff penalties, and the San Francisco County District Attorney's office is no longer an exception to this policy. Being arrested for DUI does not mean you are automatically guilty, however. Charges can sometimes be dismissed or reduced based on the specific circumstances of your case, such as a lack of reasonable suspicion for stopping you, no probable cause to arrest you, drawing a blood sample without your lawful consent or search warrant, erroneous breath-alcohol test results, and others. To ensure that you have an effective legal defense, it is important to work with a DUI lawyer who is Board-Certified by the National College of DUI Defense as approved by the American Bar Association (ABA). Only five lawyers in California are Board-Certified under ABA guidelines and approval, and this certification indicates a high level of knowledge, skill, and experience in the area of DUI defense. The information on this website will give you further guidance on the DUI process in San Francisco and how to fight your drunk driving charge. DUI arrestees in San Francisco County are processed at the Intake and Release Center at 425 7th Street and booked into the county jail. Your first court appearance is the arraignment at the San Francisco Hall of Justice at 850 Bryant Street. First-time offenders face a six to ten-month driver's license suspension and up to six months in county jail and $2,300 in fines. Aggravated circumstances such as prior convictions or accidents with injury or fatality increase the potential penalties. Independent of criminal charges, persons accused of DUI must deal with a separate administrative license suspension action with the California Department of Motor Vehicles (DMV). If you were in San Francisco on business or vacation and got yourself arrested for DUI, you have likely already had to deal with being booked into San Francisco County jail, perhaps an impounded rental car, and you may have even missed your flight home. Unfortunately, you now have to deal with the criminal DUI charges and a potential impact on your driver's license. Out-of-state residents have a significant disadvantage having to fight their DUI charges remotely, so it is helpful and recommended to have an experienced advocate representing you and working hard to minimize the negative consequences of your DUI arrest. Use this blood alcohol calculator to estimate your blood alcohol content (BAC) based on your gender, age, body weight, number of drinks you consumed, type of drinks you consumed, and the time frame in which you were drinking. It is important to note that there are several other specific factors and variables that impact the actual results of a breath test, so the results you receive here are strictly for informational purposes. Attorney Paul Burglin Co-Authors "The Bible of Drunk Driving Defense"
Since 2004, attorney Paul Burglin of the Burglin Law Offices, P.C. 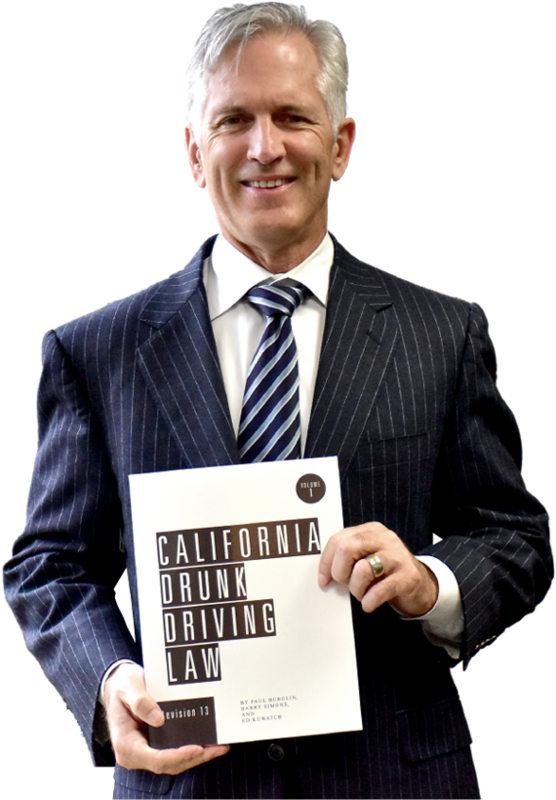 has co-authored California Drunk Driving Law, a two-volume legal guide that is commonly referenced by other lawyers in the state when they are preparing a DUI defense. Attorney Burglin is not only Board-Certified by the National College of DUI Defense, he is also a Regent for the College and Editor-in-Chief of its National Journal. If you are charged with DUI in San Francisco, talk to the attorney who "writes the book" on drunk driving defense in California! California Drunk Driving Law is commonly referred to as "the Bible of DUI Defense." It contains hundreds of innovative decision-based DUI defenses, authoritative interpretations of court cases, and answers to most questions that arise regarding drunk driving defense. This information guide is provided by San Francisco DUI defense attorney Paul Burglin. For a personalized consultation with attorney Burglin, contact us today at 415-735-3995.